inspiration from the world-wide community of WriMos on YouTube: I’m pretty sure it’s more fun to create videos about NaNoWriMo than it is to actually sit in one’s chair and write, so there is no shortage of silly (and informative) videos to share with your students; not only will they start the day laughing and inspired (with a couple writing tips to boot), but they will also realize that they are part of a phenomenon that stretches across the globe: they are writing novels with people all over the world! Here is a list of our favorite NaNo videos. check in with them on their docs: they have shared their novel draft with me, and I make sure to leave a couple comments on every doc within the first week of writing; that way they know that I am seeing their work, which helps keep them accountable, and I’m able to give quick feedback and encouragement right from the start. best lines: since our novels are still in draft stage, we don’t have polished pieces ready to publish yet, but we all can find one really great line that we are proud to share; those can be read aloud, copied/pasted into a shared Doc, or printed on index cards to post on a bulletin board. 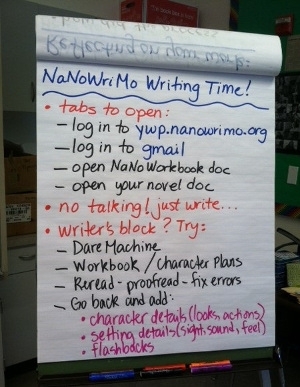 This post originally appeared on Edutopia, as part of a series on NaNoWriMo in the classroom.